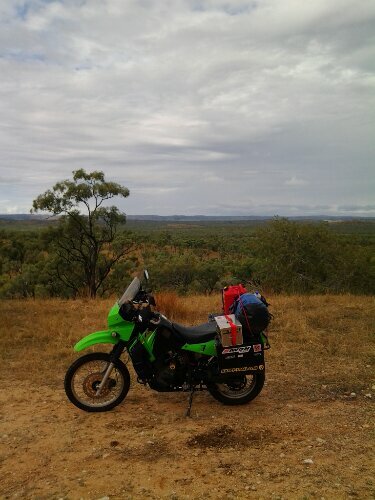 The KLR carried me up the east coast of Australia, across the Savannah Way and deep into the oft-bleak Outback. Brisbane to Darwin—3,800 miles, all said and done. Here, I learned the value of preparation. Admittedly a little naïve to the whole international touring thing, I shipped the KLR from Long Beach, CA to Brisbane, Australia during the rainy season, in the hopes that I would be able to ride Down Under during the subsequent Dry Season. Not so much. Shipping delays meant the bike spent an extra 3 months in a dank storage container, which lead to carburetion and fuel issues (and an ironic amount of rainfall). I lucked out that the mechanical failures I experienced happened near urban areas with moto mechanics readily available. The KLR picked up a new petcock in Gin Gin, Australia and new jetting in Cairns. The interior of Australia is a desolate but beautiful place. I learned a lot about myself here—requiring my full attention to make sure I didn’t get off’d by a King Brown snake, crocodile or funnel web spider while setting up camp for the night. Riding into Darwin after 3-weeks across Australian Continent, I got a sense that the scenery was about to change. I stored the bike with the service manager from Cyclone Cycles near the port of Darwin on the Java Sea and headed home to Idaho to plan SE Asia. Add massive population density and a language barrier to the mix. Remove traffic laws and first world right-of-way traditions. Mix, mash, bake at 350-degrees and you have SE Asia. My 1am flight from Los Angeles to Singapore was a restless one. Nerves about getting the bike from the Port at Jurong, finding good fuel, and several upcoming border crossings were all superseded by just getting a good night’s rest at my rough and tumble hostel in the Lavender District of this filthy-rich micro-country/mega-city. That, and the wicked humidity quickly elevated to top-of-mind status. After a restless night’s sleep, I met up with my contact, Luke Doherty—a 30-something Australian working in the telecom industry in Singapore. Luke showed me the ropes, helped me get my bike from the port and even rode with me into Malaysia. His guidance may have even saved my life on a few occasions (he insisted I get a GPS, as paper maps would surely lead to massive confusion for a foreigner trying to navigate SE Asia’s tangled roadway system). We rode into Malaka, Malaysia and cut a lap around the local markets in pursuit of appropriate cuisine. We found it—Nasi Goreng, hodge-podge noodles, durian fruit—along with a heaping serving of Malay and Chinese immigrant culture. It was cool. Luke headed back to Singapore and I stayed in Malaka for an additional day to get the stator re-spooled on the KLR. 7 months in another storage container (between Australia and Singapore) and the bike needed some love before getting into bigger mileage days. I rode through Kuala Lumpur, the Cameron Highlands, and into Thailand. Border crossings can best be described as lots of friendly body language paired with multiple exchanges of Carne Du Passages paperwork and currency, usually leading to free passage into a new country. If you asked me to write a guide for how to get into Thailand or Malaysia, I couldn’t tell you anything other than be nice, smile a lot and have your paperwork and plenty of local currency handy. I rode the KLR through the terrorist-friendly Thai southwest region (Yala Province) before getting lost in Hat Yai. Some of the most radical folks in Asia apparently live in this region—an exiled population from Burma who don’t care for Westerners one bit. It didn’t take long to debunk some of my original fears of this place though. A group of Muslim school girls on scooters wearing full hajib led me about 2 miles into the city’s center to my hotel for the evening. Their shyness matched their kindness and they rode off before I could thank them. Tropical Storm Sonamu was hot on my trail in the South China Sea, so I burned tarmac over to the Ao Nang Region for a few days of island exploration and relaxation. It was awesome to be off the bike playing tourist for a few days. I hit up Maya beach (where the movie “The Beach” was filmed) and Railay beach, as well as Ko Phi Phi Don: elephants, hikes, swimming in the jungle, pirate caves—all the textbook Thai vacation haunts. 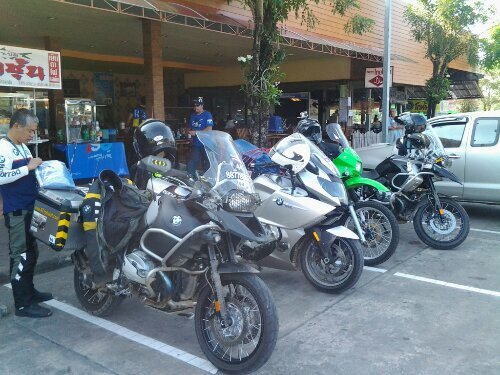 On my way out I met up with the BMW Motorrad of South Thailand for an afternoon of trans-peninsular riding. With Bangkok’s urban bubble taking shape before me and daylight fading, I elected to jump on the ultra-slow local train into the city’s center where I could avoid the nightmarish toll roads & traffic of fringe-Bangkok. The KLR rode in the rear carriage, and I collected it just in time to meet my contact in Sukhumvit Soi 65. I rode through Bangkok’s Financial District as my contact led the way through the urban chaos on a local tuk tuk taxi. A few days of exploration in Bangkok and I headed back to Boise to regroup. 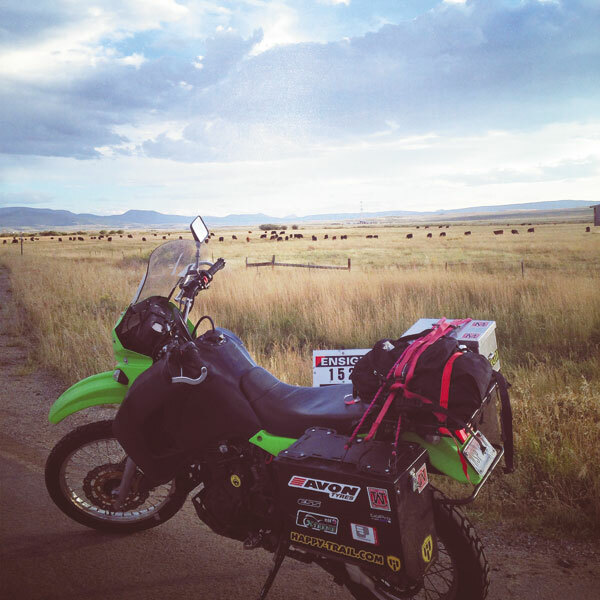 I couldn’t ride into Burma or China, so I shipped the KLR back to Seattle. Switching geographic directions, I would head eastward for Europe to finish the tour. I rode across the United States in 6-days, ending my trip just outside of Boston, Massachusetts. This was my 3rd tour across the USA, so I honestly didn’t spend much time exploring the scenery. Salt Lake, Laramie, Kearney (Nebraska), Davenport (Iowa), Cleveland, Oneonta (New York), Pittsfield (Massachusetts). The single cylinder of the KLR hummed across the USA like a singer sewing machine. The only pitfall was a dead battery from running heated grips across Wyoming. A trickle charge and I was up and running in no time. The KLR came back to Boise this summer after taking me a good portion of the way around the world. I took it out for one last ride—416 miles into Idaho’s back country with a few friends. Without getting too nostalgic, I can say that my original impressions of the KLR are still pretty much the same—although considerably refined. It is a supremely average machine that can do virtually anything moderately well, but nothing exceptionally well. Whether on single track, two-track, 2-lane or interstate, the mighty KLR is the unsung hero of all motorcycle genres. 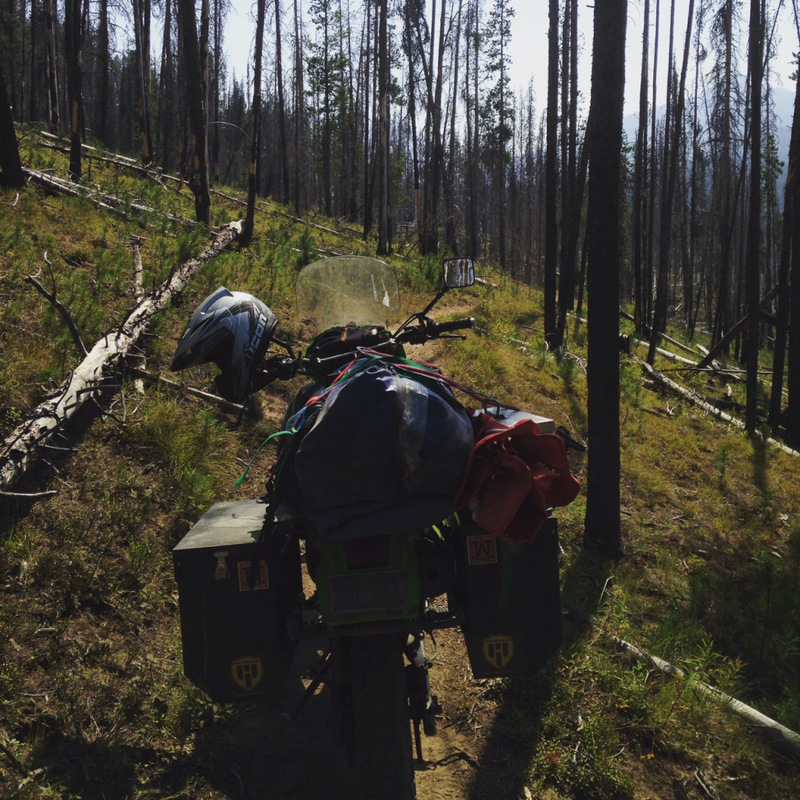 Posted in Places, Transworld TourTagged adventure motorcycle touring, around the world on a klr 650, back road motorcycle, happy trails products, kawisaki klr 650, rtwBookmark the permalink. If you could do one section of the trip over again, which one would it be and why? Australia. Would have spent a few extra days riding remote dirt tracks through the Aboriginal lands. Awesome stuff mate! It was great meeting up with you in SG and riding Malaysia. Come down and ride again soon. We’ve found more tracks worth exploring. Thanks Luke! Looking forward to the next big ride. Will keep you posted on plans. In the meantime, we have 30,000 miles of wilderness dirt tracks here in Idaho. Come ride anytime!